So, I asked my friends Laura and Meg for a recommendation over coffee at Stumptown in New York. Both of them are heart-stirring writers, and they’re my go-to girls for books that make me feel. After our chat and a little iPhone voice-memo magic, here are five books to make you feel hopeful, encouraged, understood, inspired, and interested---respectively. Love Walked In by Marisa De Los Santos When people ask me for book recommendations (which happens a lot because I’m a full time writer!) my number one choice is Love Walked In. I’m a sucker for characters that stay with you long after you’ve finished the book---as if you might actually run into them somewhere. With names like Cornelia and Teo, they were so unlike anyone I’ve ever known that I wanted to find pieces of them in people around me. This book follows so many different types of love that you’re not really sure which is the most important---whether it’s the love of a child, or the love of a family member, or the love of a lover. It’s about every type of love. Tiny Beautiful Things: Advice from Dear Sugar by Cheryl Strayed Dear Sugar is a collection of advice columns written by Cheryl Strayed, previously written under the pseudonym “Sugar”. Advice columns are usually all about the person asking for advice and not the person giving it. But, she totally turned the thing on its head and decided to talk from her own personal experience. I think this book is so great because every time you think you know the advice she is going to give---it isn’t. Her advice just calls attention to what the person is actually telling her. They already know the answer. She tells people that they have to be guided by their truest truth, and that is an immovable thing. Two of my favorite pieces of advice from her are: “every last one of us can do better than give up” and “we have to reach in the direction of the life we want.” I think about that last one a lot. Real change is happening on the level of the gesture. It’s one person creating a tiny revolution in their own life. High Fidelity by Nick Hornby “Only people of a certain disposition are frightened of being alone for the rest of their lives at twenty-six.” If you’re that type of person---and I definitely am---then High Fidelity is a book for you. Rob, an English record storeowner, narrates the story in the days after his live-in girlfriend moves out of their apartment. Hornby’s writing is funny, full of emotion, and punctuated by music references and “top 5” lists. I’d like almost any book about heartbreak, but this one especially captures the messiness and uncertainty of this in-between age---the unquietable desire to love and be loved, but the fear of being tied down. In times of happiness and in times of sadness the question is the same: is this all there is? or will something better come along? Walkable City: How Downtown Can Save America, One Step at a Time by Jeff Speck Walkable City is the perfect book for cocktail party conversations with the hip and urban. After reading it, I’ve started quite a few sentences with “did you know _____?”. (Did you know that additional highway lanes often make congestion worse because of “induced demand”?). Being from Portland, Oregon, I have first-hand experience with a lot of the things that Speck says make a city walkable---and ultimately, wonderful. His argument is so compelling because it has less to do with buying into “being green” and more to do with the tangible things that make life better. Cities have corner coffee shops, chance encounters on the sidewalks, easy errands, and less time spent in traffic. All of these are the reasons why cities like mine and San Francisco, Chicago, New York and even Charleston are attracting disproportionate numbers of the bright and creative. Slouching Towards Bethlehem by Joan Didion I’m pretty sure Joan Didion is my spirit animal! 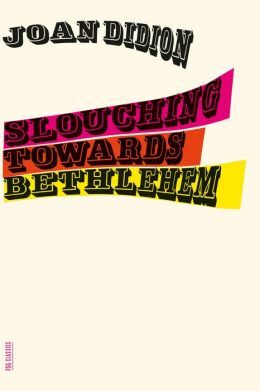 Slouching Toward Bethlehem is a collection of her essays about California and the counter-culture movement, written in the style of “New Journalism”. It isn’t removed third-person newspaper writing---her sentences have such extraordinary presence and clarity. She’s inspiring to me as a researcher too, because she’s acutely interested in the way people live their every day lives. One of the personal essays in this book, On Self Respect, is the most important piece of non-fiction I’ve ever read. In it she writes “People with self-respect have the courage of their mistakes. They know the price of things.” Without it “we are peculiarly in thrall to everyone we see, curiously determined to live out . . . their false notion of us.” As a people-pleaser, it’s a bit of tough love that I’ve always needed.